Behind every revolution, there’s an inspirer who like a beacon throws light on issues that need solutions. To us the inspiration is none other than our respected Prime Minister Shri Narendra Modi ji who with his various social endeavours such as Swachh Bharat Abhiyaan amongst many others has awakened the citizens to become responsible towards their surroundings and do their best to conserve it. We salute his spirit and his leadership. He is the torchbearer for millions of Indians including children. He is our hero and a true inspiration. On behalf of the team of Gaali Free India-Swachh Bhasha Movement and all its supporters, we humbly appeal to our respected Prime Minister Shri Narendra Modi ji to support this drive and be part of its revolution. It is only through the impetus of our revered Prime Minister that this drive can take mammoth proportion and create lasting impressions on minds of millions of his fans who look up to him for a fresh perspective in India’s growth story. We are certain that he is the one who will bring about a wind of change and project the seriousness of this issue and not just appeal but also influence millions of Indians to make Gaali Free India, a possibility. Shri Narendra Modi ji… over to you… now! The Gaali Free India-Swachh Bhasha Movement is the brainchild of Ms. Vandana Sethhi, an advertising professional. A true Indian at heart, she cherishes and values the cultural heritage and the sanctity of languages. She opines strongly that people’s identity is not through their status quo or high birth, but through the language they use in their day to day life. Those who respect their language never use ‘gaalis’ and those who use gaalis in any language are never fully literate in the real sense. Language that’s replete with curse/abusive words, demeaning meanings, demoralizing words and disrespectful diction is a drain on the nation’s rich cultural heritage. It is a blot on the nation’s deep rooted values. "Gaali is a modern disease and its cure is purely with you. Each and every one of you! Get cured before it’s too late." – Vandana Sethhi. Pledge to never use gaalis. Encourage and inspire everyone not to use gaalis. Drive others to participate in the Gaali Free India Movement. 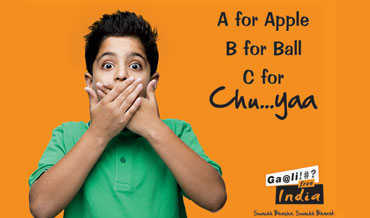 Work towards a Gaali Free language for the future generation.